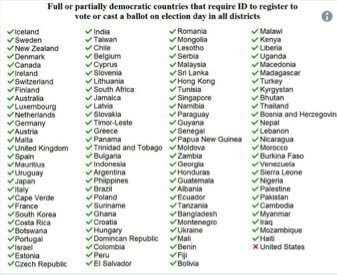 It’s strange how the poorest nations of the world even pretending to have democracy will require ID to vote and dip a finger in ink to ensure you only vote as yourself and only once. To vote more than once, one would have to cut off a finger. Having to show at the next polling site w/ a hemorrhaging finger would be suspicious. Here they act like showing the ID (we all know they have) is too much for them to be expected to deal with. In some African nations you wear ink on your finger for weeks.